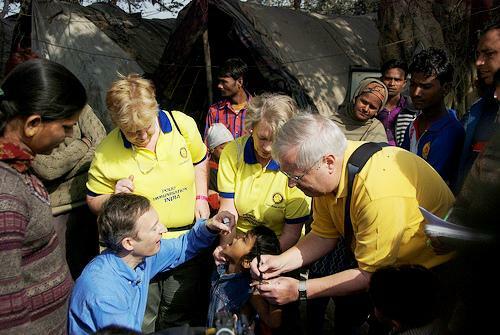 Newbury Rotary sponsors and supports a variety of international and global Rotary initiatives and charities. Our principal international focus is fundraising for the END POLIO NOW campaign through the Rotary Foundation PolioPlus charity. 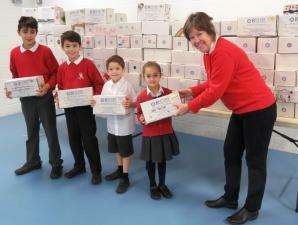 We also donate funds to the Rotary Water Survival Box and Shelterbox charities and to the Rotary Shoebox Scheme. In response to the Philippines disaster in November 2013, Newbury Rotary has made additional donations to MapAction, Shelterbox and Water Survival Boxes. Further donations have been made to MapAction in 2015 in support of their work in Sierra Leone for the Ebola Crisis. 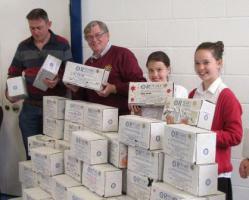 On June 15th, Newbury Rotary Club collected some of the 300 Rotary Shoeboxes filled by pupils from Falklands Primary School. They will soon be en route to under-privileged children and old folks in Eastern Europe. 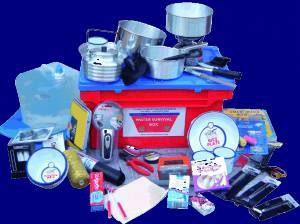 Rotary Water Survival boxes are sent to disaster areas all over the world.